196 pages | 24 B/W Illus. Throughout history and in every geographical location, the rise and fall of industry, which impact the fate of large populations, are tied to the development and cultural entanglement of particular models that are articulated with political power. Models are understood as knowledge devices – expert, theoretical, practical and commonsense – that are embedded in cultural and social environments and designed through struggles at various scales. This book results from the collaboration of an interdisciplinary team bringing together specialists in anthropology, geography, sociology, economics, political science, mathematics and engineering around the theme of ‘Models and their Effects on Development Paths’. 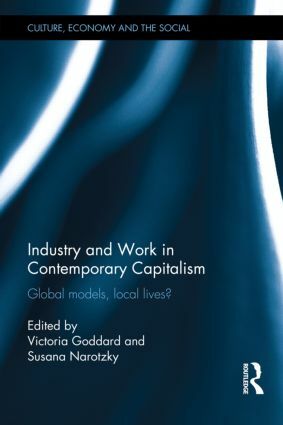 Based on empirical research conducted on the heavy industries, Industry and Work in Contemporary Capitalism addresses how models that inform the organization of work and production and are created by powerful actors may diverge from, overlap with, or contradict the models articulated by less powerful actors on the ground, and how they are connected across material and cultural spaces. Careful observation of industrial work and production as they unfold in and across specific localities and affects people’s livelihoods is complemented by analysis of how models circulate, through which channels of power, which institutional entities, which political connections. This volume explores an extensive theoretical terrain and a number of empirical cases that show, from different perspectives, how ideas about the economy, about work and industry, materialize in specific practices and interventions that affect people’s livelihoods. Victoria Goddard is Professor and National Teaching Fellow at the Anthropology Department of Goldsmiths, University of London. She has carried out research on informal sector work, households and small-scale industry in southern Italy and on gender and politics in Argentina. Her publications focus on informal economies and politics, with an emphasis on gender and work. Susana Narotzky is Professor of Social Anthropology at the Universitat de Barcelona and Fellow at the Amsterdam Institute of Social Science Research, University of Amsterdam. She holds the Fellowship ICREA-Academia awarded by the Generalitat de Catalunya for the period 2010–2015. Her research has focused on issues of informal economy and the politics of deregulation. Her project ‘Grassroots Economics: Meaning, Project and Practice in the Pursuit of Livelihood’ (GRECO) was funded by a European Research Council Advanced Grant 2012.